Alright friends, here’s the highly requested low carb food list printable! Because there’s a lot of conflicting information out there, and I want to put to rest all those silly rumors and answers some lingering questions you guys have on what a printable keto food list actually contains. Examples Of Carbohydrates that sneak up on you! Enter your email below, and I’ll send you a free, concise, and printer friendly low carb food list printable! It includes low carb food by food group, plus their net and total carb counts. Put it on your fridge, keep it in your wallet — it’s a great way to learn and remind yourself of what is and isn’t low in carbs! 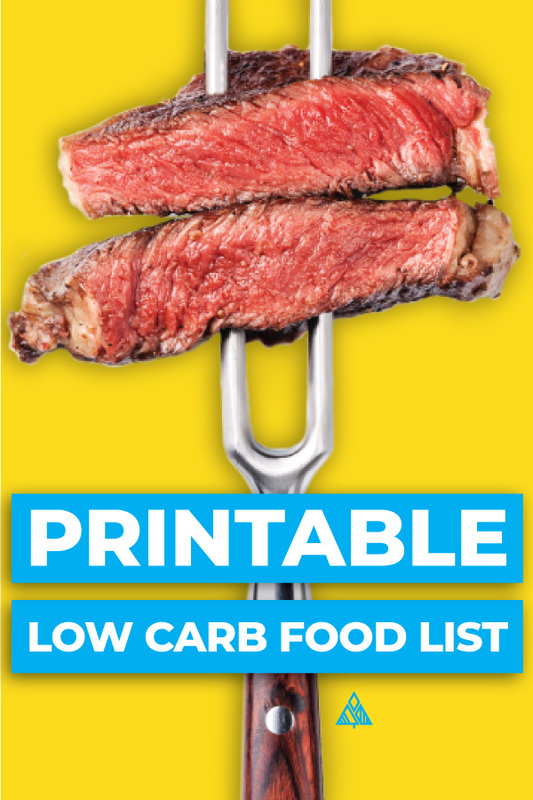 Download Your Free Printable Low Carb Foods List Chart! Meat, Fish + Eggs — Beef, lamb, poultry, pork, fish and eggs. Low Carb Vegetables — Arugula, spinach, lettuce, mushrooms, cucumber, bell peppers and celery to name a few! Low Carb Fruits — Avocados, coconut and berries are your best bet. Low Carb Milks — Coconut milk, almond milk, hemp seed milk — read the labels as some brands may add sugar to their products. Low Carb Sauces, Oils + Condiments — Pesto, olive oil, coconut oil, soy sauce, low carb ketchup, etc. Pst, there’s a specific sauce you love, chances are there’s a low carb version of it out there! *For a full carbohydrate food list chart of each food group, and more details about each low carb food list printable item, click the link. Believe it or not, no carb foods are a thing — meats such as chicken, beef, and seafood are no carb grocery list items, while eggs and cheese have almost no carbs. Some keto vegetables are so low in carbs, they hardly count! Unfortunately, a lot of the foods we grew up eating are high carb foods — from grains to fruits to sugar. But have no fear, there are plenty of delicious low carb substitutes to choose from! Grains + Products Made from Grains — such as wheat, oats, quinoa, rice, barley, rye. This also includes products like pasta, bread, crackers, etc. Starchy Veggies — Potatoes, sweet potatoes, parsnips. This includes potato chips and french fries. Drinks — Cow’s milk, liqueurs, sugary cocktails, high carb beer, candy, soft drink, fruit juice, sports drinks. Don’t let labels such as sugar free, gluten free or paleo deceive you — these are often examples of carbohydrates and are used to classify foods based on a completely different criteria. To decipher whether a specific food is a low carb food list printable item, your safest bet is to always read labels, do your research, or ask a serving. Some of the lowest carb foods are high protein low carb foods! Of the macronutrients, protein is the best suppressor of the hunger hormone, ghrelin, that makes you feel hungry. This is why protein keeps you full longer. Some cheeses such as parmesan and cottage cheese — parmesan has 8 grams of protein and 3.9 grams of carbs per ounce. Some keto nuts such as peanuts — 7.3 grams of protein and 4.6 grams of carbs per ounce. Low carb Greek yogurt (higher in carbs than other options) — 19.9 grams of protein and 7.8 grams of carbs per 7 ounces. Heavy Cream — 5.4 grams of fat per cup. Cheese — cheddar has 9.5 grams of fat per ounce. Low carb nuts — pecans have 17.8 grams of fat per 1/4 cup. Eggs — 6.7 grams of fat per egg. Avocados — 35.4 grams of fat per cup. Olives — 10.9 grams of fat per 100 grams. Oils — 13.5 grams of fat per tablespoon. Avocados — 15.6 grams of fiber per cup. Flax seeds and chia seeds — 2.8 grams of fiber per tablespoon. Coconut flour or unsweetened coconut flakes — 7.2 grams of fiber per cup shredded. Raspberries — 8 grams of fiber per cup. * All nutritional data in this printable low carb grocery list was pulled from the USDA Nutritional Database — this is an awesome resource for people on a low carb meal plan, as most carb counters are run on user input, whereas this is not. Now that you’ve got this list of low carb foods to eat, clean out that pantry, grab your favorite low carb cookbook and head to the grocery store! I keep all my low carb resources and recipes together in a binder for quick and easy referencing. * Download this PDF to your phone to check on the fly whenever you’re in doubt! I hope you find this low carb food list printable pdf easy to use! Leave me a comment below and share where you’re at along your low carb journey! Also, let me know if I missed your favorite low carb food chart items. Hi Ria! I just sent it to you 🙂 Let me know if you don’t get it for some reason. I love your site. It has been very helpful. Such wonderful wonderful resources. Can you please send the cookbook and the printable low carb list? I haven’t received either after subscribing. Thanks!